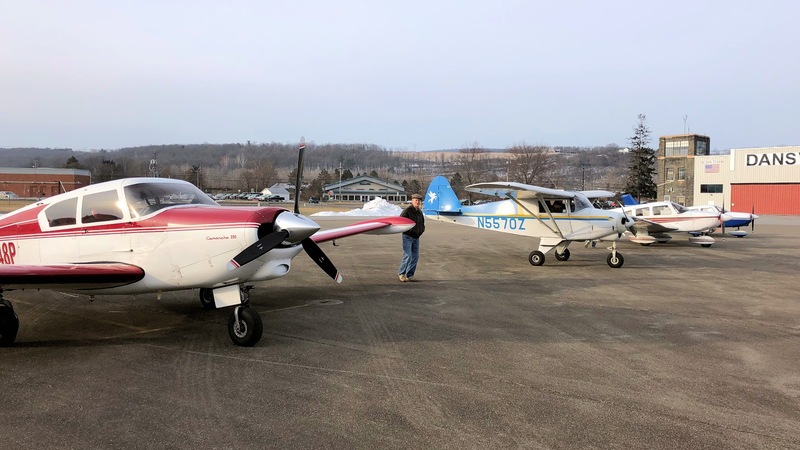 Rochester Approach: "Seven aircraft departed Sodus for Dansville the same time you did. Are you going down there because of the wind storm that's coming?" Denny: "Just going there for breakfast." Nope. We want our airplanes in their respective hangars for that wind storm, thank you very much. As for breakfast, any excuse in February to exercise the airplanes and circulate some oil is a good one. I launched behind Alan in the Champ and Lee in the Colt. 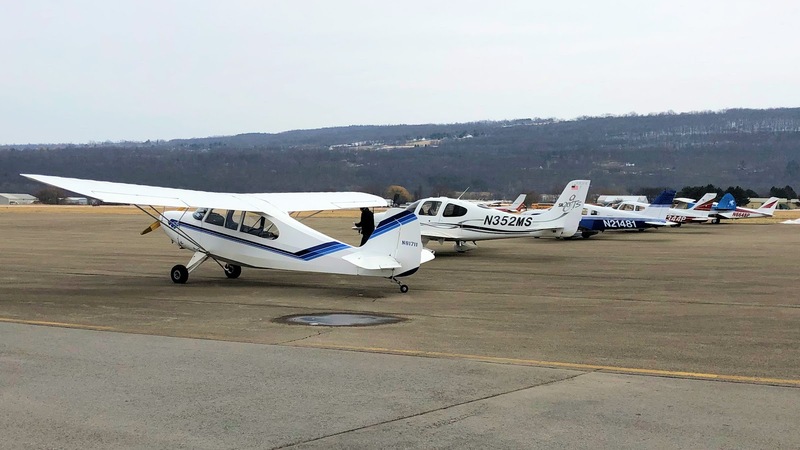 Queued up behind me were Ed in an Archer, Brad in a Cirrus SR-20, and Mick in his souped-up Cessna 152 II. There were so many airplanes waiting to launch that KSDC felt more like KATL (or, frankly, Alton Bay last weekend). Though Rochester Approach misconstrued the reason for our flight that day, he certainly hit on a key issue: the gaggle of airplanes that all left Sodus within a few minutes of each other. From these scenarios, I have developed a keen appreciation for traffic information delivered by ADS-B. It helped me keep better track of my friends in their airplanes, particularly those behind me and outside of my field of view (except, of course, for Alan's Champ, which is not transponder-equipped). Visually, I had Lee in sight as I passed his Colt and I could verify Ed off my left shoulder 800 feet above and slowly overtaking me. Rather than fly the magenta line direct to Dansville, I chose to fly a more southerly heading to Canandaigua Lake, then follow the valleys for a southeasterly approach to the Dansville Airport. There were several advantages to this route. It was more scenic, it lengthened the flight time to help outgas moisture from the oil, it ensured that the faster airplanes got to the airport before I did (the Comanche and the Cirrus, both of whom departed Sodus after I did), and it evened up the flight time versus the slower airplanes (the Champ and the Colt). It was a calm, smooth morning to fly. With 70 mph wind gusts anticipated the next day (the aforementioned wind storm), Saturday morning was clearly the right time to fly. 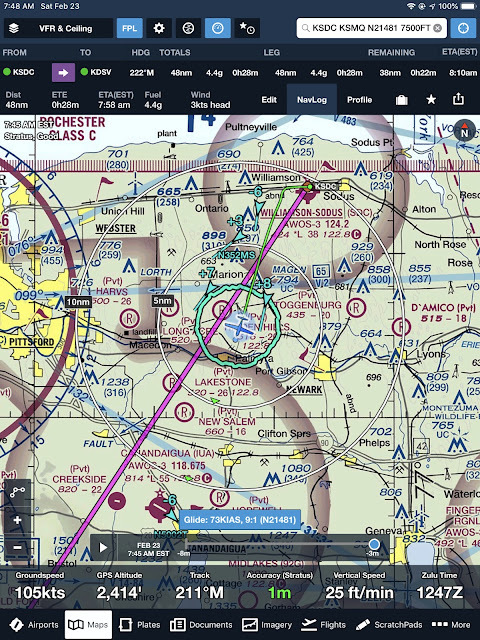 As I flew over Canandaigua Lake and among the hills, I activated ForeFlight's synthetic vision for the first time. Not only was the surrounding terrain well-depicted, but Ed's airplane, which had just flown 500 feet above me, was clearly plotted. 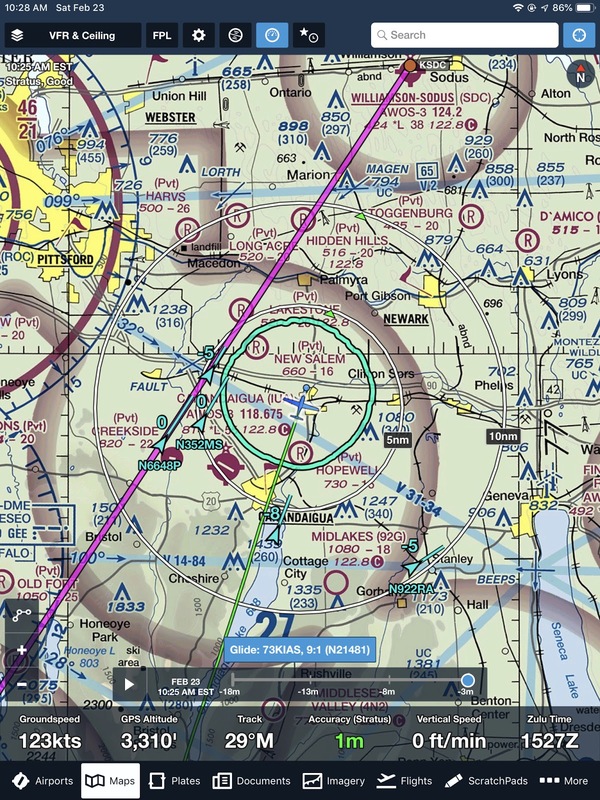 Meanwhile, I could see that Denny's Comanche and Brad's Cirrus were rapidly closing in on our destination. I caught Ed in the act of overtaking my Warrior from 500 feet above. Having Denny and his Comanche along always lends a touch of class to any group fly-out activity. What happened to the Dansville sign?! Once everyone was gathered on the Dansville ramp, we set off on foot for the truck stop diner that offers the best local culinary option to itinerant pilots. There were a lot of flying stories shared over breakfast and I may have passed my phone around the table with the video of our landing at Alton Bay the week prior. When we returned to the ramp, I was struck by the diversity of our fleet that morning. We wouldn't have it any other way. Alan, Lee, Mick, Mike, me, Alicia, Ed, Denny, Brad, Tom. Photo by "Tom". We pretended that there was not a cold wind blowing directly in our faces while posing for this group photo. Mick running up his 152. On the return flight, I was struck once again by the utility of the traffic display when flying with a group. I was able to watch Denny's Comanche (48P) come from behind, draw even with me (at which point I had him visually), and reach the airport just ahead of me. Our eyes can only see so much and, while the traffic display cannot replace them (nor should it - look out the windows, people! ), it is a wonderful supporting tool. 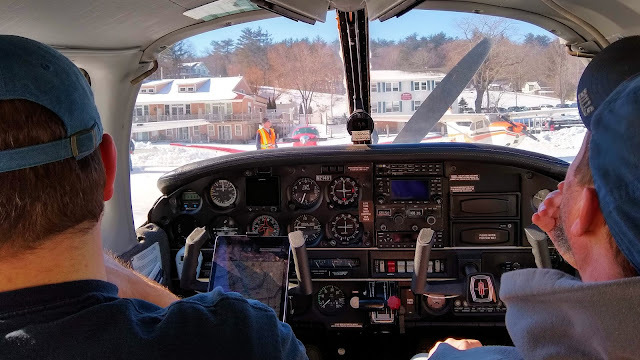 Boston Approach signed off with, "Cherokee Four Eight One, be advised that there are multiple aircraft inbound to Alton Bay, squawk VFR, frequency change approved." My heart sank. 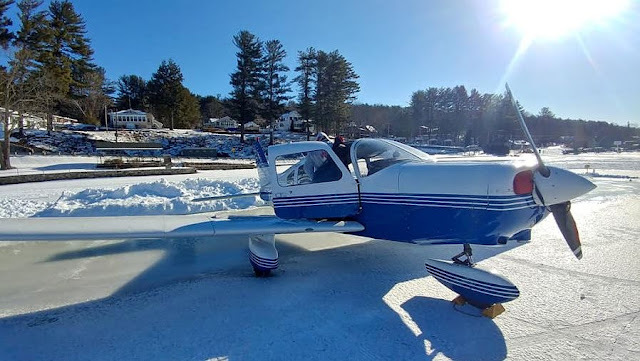 We were en route to the famous ice runway hewn from the frozen surface of Lake Winnipesaukee (for more information, see here). Alton Bay's Winter Carnival was going to start within the hour and was historically the busiest time for the New Hampshire ice runway. 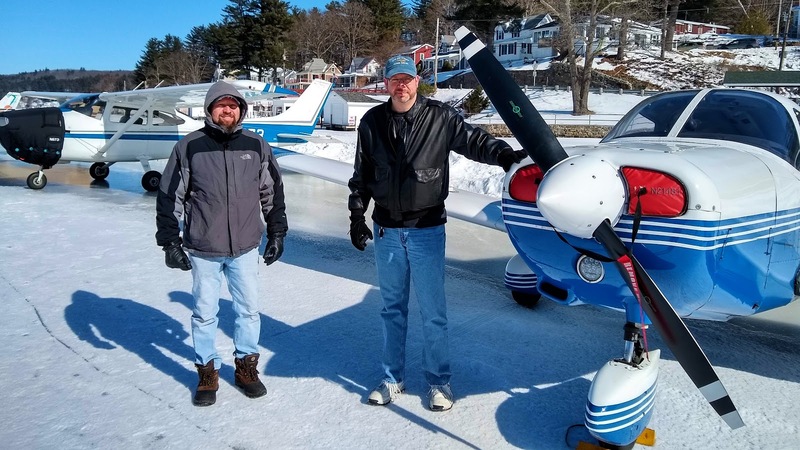 A day prior, airport manager Paul LaRochelle posted an entreaty on-line for only experienced pilots to land on the ice during the Carnival. He expected a lot of traffic; could only park about thirty airplanes at once; and was still smarting from bad publicity in the news media when an Arrow landed downwind (i.e., too fast) a week earlier, failed to stop on the ice, and crashed spectacularly through a snowbank. Understandably, Paul wanted all pilots arriving at Alton Bay to be on their game for the Winter Carnival. Hoping to beat the crowd, we were aloft by 7:00 am that morning. Would airplane parking be full? After the advisory from Boston Center, I wondered if it was all for nothing. That morning, I awoke abruptly to utter silence and darkness beyond my bedroom windows. What's the deal? I wondered groggily. My alarm clock has not gone-off yet, so why am I awake? Still, I mustered some energy and rolled over in my warm cocoon of blankets to read the bedside clock. 5:45 am. I meant to be out the door at 6:00 am that morning, but the alarm clock had been silenced by user error. I leaped out of bed, did the preflight planning, showered, dressed, and managed to leave the house by 6:15 am. I have no idea how it works, but I am thankful for my internal alarm. Otherwise, my friends would have been standing around at the Williamson Sodus Airport, having successfully set their own alarm clocks, and wondering what the heck happened to me. 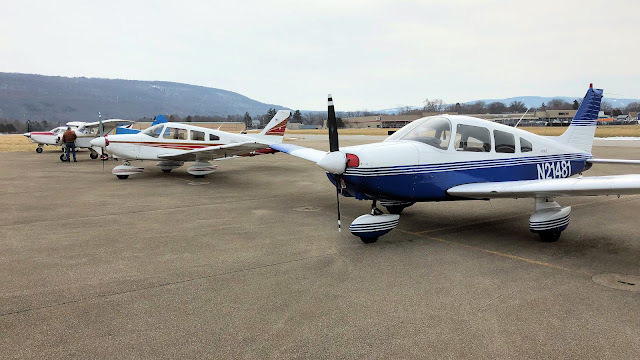 Scott, Jamie, and I departed the Williamson Sodus Airport beneath a 2,000 foot overcast and traveled ten miles east before leaving the low clouds behind and climbing to 7,500 feet in the cold air. With a tailwind, the estimated flight time was two hours and nine minutes, which would put us at Alton Bay by 9:10 am. With the Winter Carnival starting at 10:00 am, I hoped that this was early enough to find available airplane parking. As they say, "Hope is not a strategy." 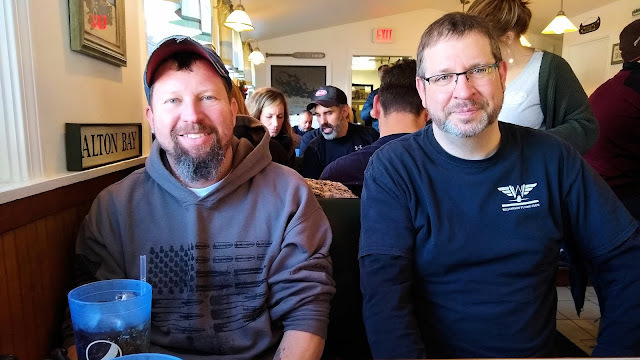 Our Plan B was breakfast at The Flight Deck Restaurant in Keene, NH. It would add a new airport to my map, but was otherwise a relatively uninteresting alternative to landing on the ice. Piseco Lake in the Adirondack Mountains. Photo by Jamie. 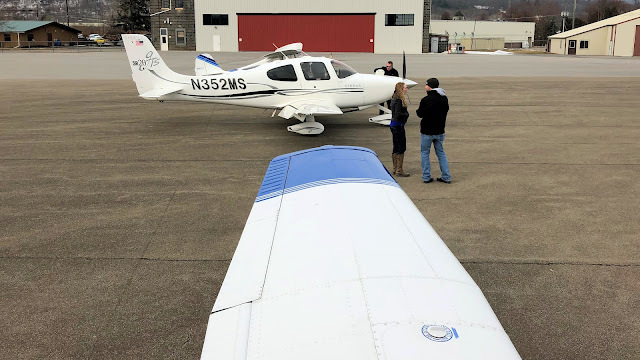 I suspect that it was the longest General Aviation flight either of my companions, both relatively recently certificated private pilots, had ever experienced. The direct route took us over the Adirondacks and the Green Mountains. 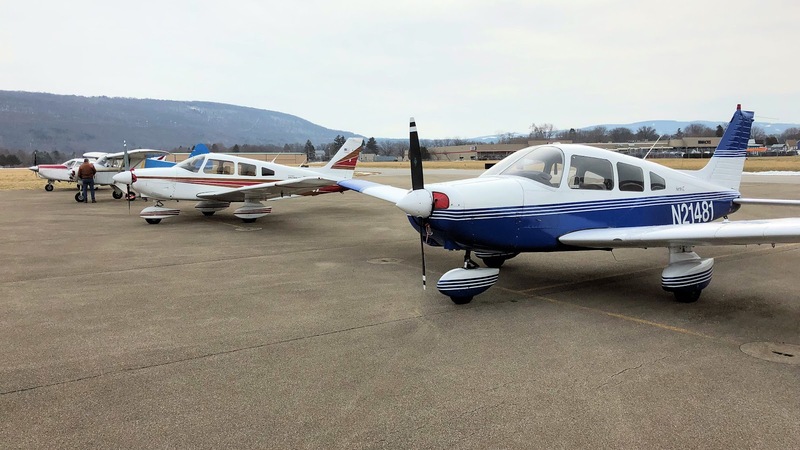 Along the way, we picked up some company, a Trinidad from the Syracuse Flying Club, Four Alpha Victor. From its trajectory, the other aircraft was also likely bound for Alton Bay. It slowly passed us over the course of forty minutes. Frustratingly, though it was at our altitude, only a few miles away, and clearly shown as traffic on my iPad, none of us ever successfully got a visual on the Trinidad. That was humbling. We received many warnings that the ephemeral airport was busy as we neared. 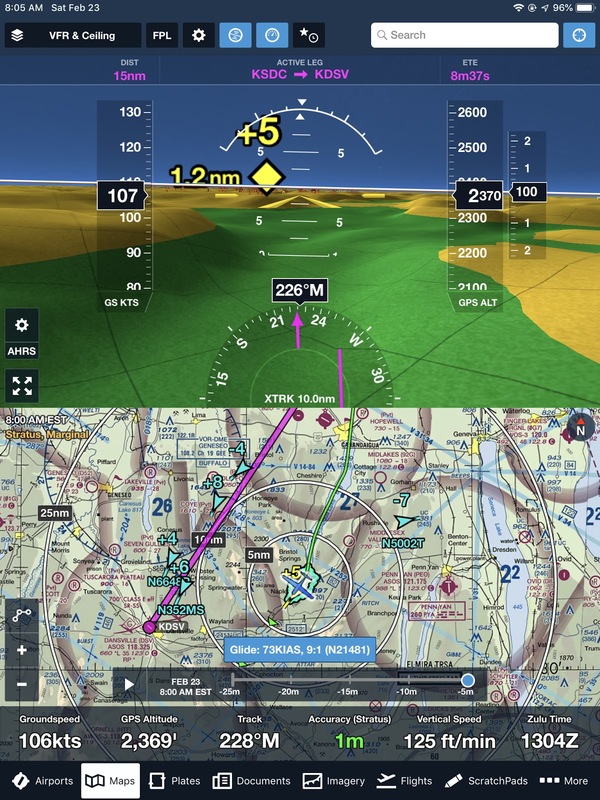 In addition to the advisory from Boston Approach, traffic data uplinked by ADS-B showed multiple aircraft converging on our destination and radio chatter confirmed it; each unique voice corresponded to a little triangular airplane avatar on the traffic display. 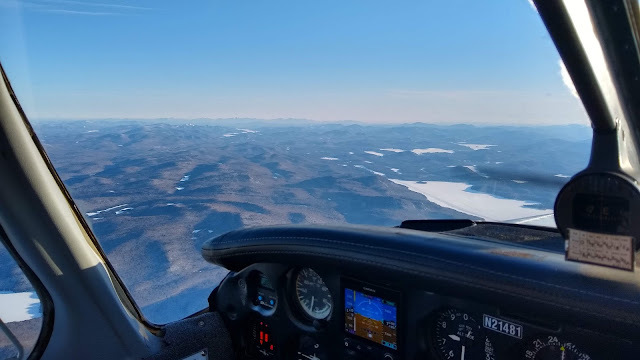 I approached from the north, following the Lake Winnipesaukee shoreline until our trajectory merged with the airport traffic pattern. We arrived at the tail end of a cluster of landing aircraft, roughly 6-8 airplanes that landed in a 15 minute interval, including our friend Four Alpha Victor. Parking was about half full when we entered the traffic pattern. We were going to make it after all. Jamie captured video of our landing, some other aircraft landing, and our departure (above, courtesy of Jamie and edited by me). Finding myself high on final, I coasted power-off toward the ice in a mild slip. We touched down where the runway numbers would have been had they existed. Though I did not execute as significant a flare as I normally prefer, the landing was quite smooth. "Like butter," Scott commented from the back seat. He later noted that he never felt us touch the ground, but I pointed out that that was mostly because we landed on a lake. Sometimes, it amuses me to be literal like that. Warrior 481 parked on the ice. Photo by Scott. 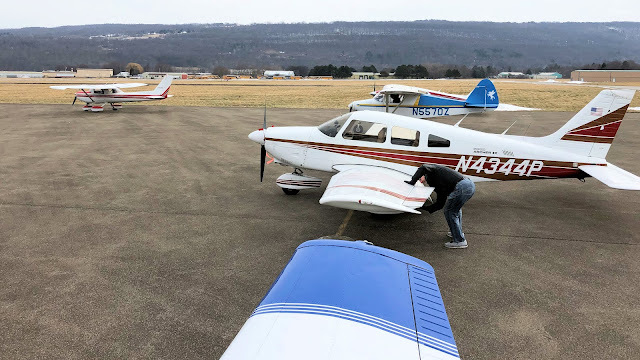 Paul's band of ice runway volunteers efficiently managed ground traffic and, after holding briefly on the parallel taxiway for a landing Cherokee, we were directed to parking. In pushing the Warrior back into a "parking spot", I re-introduced myself to Bob, the volunteer who helped us park the year before. Me and Scott being photobombed by an airboat. Photo by Jamie. Me and Scott squinting into the sun. Photo by Jamie. The biggest change from past visits was that the parking area was filled with non-aviation people, visitors to the Winter Carnival wandering the ice and looking at all the airplanes. It was great to see the widespread interest, but starting the engine and departing the parking area were a bit nerve wracking when the time came owing to a lack of "propeller awareness" on the part of the general public. While Paul helped to reposition a ski-equipped Piper Pacer, I stopped to reintroduce myself and to thank him for his amazing dedication to this very unique airport. This is truly a labor of love for him. As we wandered out of the parking area, we finally got that visual on Trinidad Four Alpha Victor. Scott and me. Photo by Jamie. We had breakfast at the Olde Bay Diner, an establishment so small that it clearly inspires efficiency among the staff. They moved a lot of people through there on Winter Carnival day. It was a second breakfast for me, hobbit-like as I am. There was no way that I would have flown two hours on an empty stomach. After breakfast, we counted about thirty five aircraft on the ice. Alton Bay was at capacity. After surveying the various aircraft parked on the ice, we returned to the surface of the lake to explore the Winter Carnival. Helicopter rides were being given from a circular helipad cleared on the ice. Horse-drawn sleigh rides were a popular part of the festivities. We missed out on the "ice yoga". I would have loved to have seen this in action, but the wind was reasonably light. Toasted marshmallows were definitely a hit. Toasted toes might have been even more so after all that time on the ice. As were doughnuts sold from this pontoon boat. And still, the aircraft came. Jamie is very intrigued by Seareys and spent some time investigating this one. It is a shame that the owner was not nearby to consult. Parking was full when we returned to the Warrior and Paul was turning aircraft away via handheld radio; Alton Bay was closed until more space opened up in the parking area. Me and Scott. Jamie had the front seat for the outbound flight and swapped with Scott for the return. Photo by Jamie. Nearby, a Bonanza started up and taxied toward the active ice runway. I waited to fire up the engine because of a woman standing three feet in front of my airplane taking pictures. Once she moved off, I got the engine turning and was marshaled out of my parking spot by the ground crew. As the Bonanza and I waited to exit the parking area, Paul held traffic on the taxiway as arrivals continued to descend over the top of us. Finally, Paul closed the airport to new arrivals so that we could depart. Overall, the crew at Alton Bay managed the chaos very effectively. 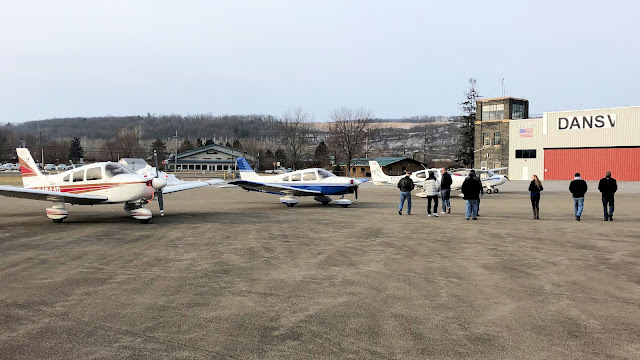 At the end of the day, about 150 aircraft landed at Alton Bay, quite an accomplishment for an airport that is only open a few days each year. Paul indicated that it was likely a record-breaking day for them. I was thrilled to be able to return, to share the experience with my friends, and to have been a part of the record-setting day. Now that is what I call time well-spent!